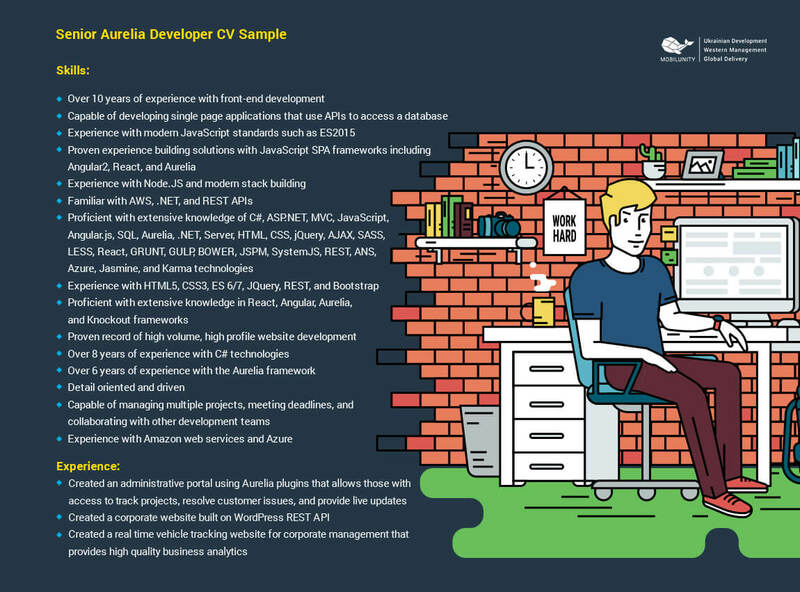 Home / Blog / IT Staffing / Is It Hard to Hire Aurelia Developer in Europe? Is It Hard to Hire Aurelia Developer in Europe? High modularization – Aurelia is composed of several small libraries which may be used individually or together. A coder can simply select any number of libraries from the collection without having to worry about their dependencies with each other. Usually, developers with Aurelia JS skills choose it for their projects because they do not want to build an application using more than one library. In this case, Aurelia JS does not only give them what they need but also shows excellent flexibility, giving access to every component of the code. How to Hire Aurelia Developer? Get the best Aurelia Development services with Mobilunity! Aurelia development: How Popular It Is Nowadays? We say – very. There are over a thousand of websites, that are currently using Aurelia development, and this number is growing day by day. The biggest part of its users are different international companies, as Aurelia fits perfectly for business needs due to its simplicity and flexibility. Moreover, it is mainly used in English-speaking countries, like the United States or the United Kingdom, though you might find someone with excellent Aurelia JS skills in Germany or Canada as well. According to statistics, these countries hold the third and fourth places on ‘Aurelia popularity’ list accordingly. By choosing Aurelia for your business needs, you have to realize, that it was mostly created for web applications, not desktop ones. From this point of view, Aurelia JS is exactly what you need, being one of the most compact frameworks and having a minimum amount of constructions inside of it, which in some cases can be crucial. For example, if you compare Aurelia with its main competitor on the market, Angular 2, you will see, how more convenient it is. By using Aurelia, you can be sure, that your code will be more clear, without all those unnecessary constructions. Aurelia JS Skills: What To Look For In Aurelia Framework Resume? Solid grasp of modular programming. Years ago, JS’s biggest flaw was the lack of modular programming. Now the situation has changed and there are more than several approaches to that. It would be great if your future employees’ Aurelia framework resume mentioned proficiency in at least a few of those. Excellent collaboration skills. Very often in the web development field, the final success of the whole project depends on how good the cooperation between programmers was. It is crucial that your future employee not only is able to contribute something new to the already existing team, but also successfully cooperates with all of its members. Strong background in unit testing. Basically, this means that your future Aurelia specialist must know how to run through separate parts of the code and detect any flaws and mistakes it might have. It is obvious, that all across the Europe Aurelia JS salary varies greatly. However, if you take a look at Ukraine, you will see, that services of experts of Aurelia JS cost the lowest there. At the same time according to HakerRank Ukraine is among the first 11 countries where most skilled programmers live. Having considered Aurelia JS salary of Ukrainian programmer, maybe it is not that bad of an idea, to hire one? Now that we finally got familiar with the concept of AureliaJS salary, let’s get to types of employment for Aurelia developers. Usually, for this type of job, there are three main employment opportunities – freelance, in-house and outstaffing. You might be wondering what each of these means, so we now will quickly get into it. This option is especially popular with most programmers. The best part, of course, is the ability to choose the place where one will be working from. The second great thing is the opportunity for a freelancer to set his own AureliaJS rate by himself. In most cases, he has to follow the principle ‘the more you work, the higher your Aurelia.JS salary is’. This type of employment gives the employer the opportunity to reduce Aurelia JS price for himself, as he will not have to pay taxes for the freelancer, as if he was an official member of his team. This is a variation of an official employment, but in this case, the programmer will be able to work from home. With this job form, his Aurelia JS rate depends from the employer. This option is not very common nowadays, but over the last couple of years, more and more companies started following this trend and giving their employees more freedom. This way, programmers can work in the most comfortable for them surroundings and, therefore, deliver more quality results. This type of employment also often goes by the term ‘outsourcing’. This means that the company delegates part of the job to another, smaller company or some particular specialists. This is especially useful in the field of web development as it allows involving some amazing specialists at comparatively low, as for the specialist of Aurelia cost. In this case, the company-employer can set the primary focus on more major tasks and leave smaller ones to outsource specialists. Excellent experts of Aurelia framework, who have years of experience in the web development field. Variety of options – there is more than one programmer, who specializes in Aurelia JS, so you can choose among several potential employees. Technical support during the whole process of working on the project. You can be sure, that you will get answers to any technical question you might have during any part of the day. Broad experience and extensive base of satisfied clients – when Mobilunity specialists claim to be the best – these are not just words, they can support that statement with a constantly growing number of satisfied clients. More importantly – hiring an Aurelia JS programmer into your team brings you at least three possible types of employment for him, some of which will allow you to significantly decrease your expenses. If the benefits of this framework appeal to you and you wish to find a good Aurelia developer for your next project, then you are in luck! At Mobilunity, we offer software Europe’s most talented dedicated AureliaJS developers. Located in Ukraine, our rates are among the lowest in all of Europe, so you can rest assured that you would be getting the best value for your money. Contact us now and let’s get the ideal Aurelia developer for your project! What Is The Difference Between HTML5 Developer And Other? How Much Does It Cost to Hire a PHP Developer in Ukraine? Where Should You Hire UI Developers?